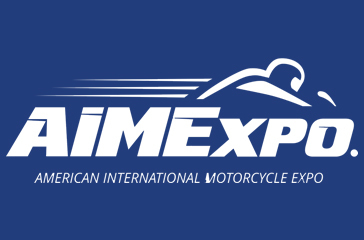 Attending and speaking at another great AIMExpo, American International Motorcycle Expo, recently in Orlando was very rewarding and enlightening. The passion and drive for the powersports industry to continue to grow, learn and better serve their loyal customer base was very apparent. I was glad to see many familiar faces I’ve had the opportunity to meet and work with over the years and also some new faces that were eager to learn. Presenting an educational session, Mobile Marketing Solutions for Every Dealership Department, with Samantha Scott from Pushing The Envelope, gave me a fantastic opportunity to both educate interested dealers about mobile marketing but also learn from them on where they are today on their mobile strategy. A great deal of the session was spent sharing very much of what I’ve shared here on my PSB blog over the year. As interested as dealers are to be on the cutting edge of technology, it was also very apparent that the basics and simple solutions are still very viable for success. Dealers are still very unaware of the power of their customer data. They input customer information after a purchase and for many that’s all that’s ever done. Dealers aren’t aware of how to leverage all that valuable data for future sales opportunities. Outside of email blasts and some very expensive roto-calling campaigns dealers don’t realize the opportunity for mobile and a simple text message strategy. It’s always great to see dealers raise eyebrows when you start talking about how using their data to target a customer almost one-to-one with very little effort through text alerts. FIND WAYS TO USE YOUR DATA! It’s incumbent on owners, GMs and department managers to find a solution that guides them and challenges them to better serve their customer by taking the data and using it to it’s fullest potential. Dealers get the “less is more” mantra. Some years back speaking at motorcycle events I would get inundated with questions about apps, QR codes and other mobile technologies that were emerging. Dealers wanted to implement the latest thing. But as dealers have learned and grown with the technology over the years they are starting to understand their customers aren’t as ready for the latest greatest thing as they think they are. Customers still are most responsive to the basics. And dealers listening to there customers and finding mobile partners to help educate them on how to find immediate success has helped stabilize some of the industries expectations and technology needs. Permission to contact customers is still very much a question for dealers. None of us want to upset a customer, much less get sued for being overzealous marketers. So they idea of taking that customer data and using it for marketing is still a scary tactic. The great news is that as the mobile industry continues to mature, the customer expectations about mobile is starting to become more apparent. Ask those around you if they would prefer a simple text alert to pick up their bike from service at their favorite dealership or a call, voicemail and lengthy conversation? It’s not a matter of whether customers will be accepting of this communication, but rather the customer now wondering why you aren’t already communicating in this simple manner. The legal requirements set forth by federal authorities are not as confusing as they were just a few short years ago. A good mobile partner knows exactly how to navigate these laws and regulations to help you be fully compliant and in good standing with your customers. There’s no stopping technology, and dealers are incredibly interested in embracing it to better their dealership. I didn’t hear anyone disparage technology and it’s impact on their business. Dealers wanted to know more how to improve what they are already doing and do new things they have not yet pursued. Mobile optimization for the likes of Google and other search sites came up and instead of complaining about extra work on the dealers they were asking what they had to do to improve and be better indexed. It lends to a very bright future for technology and dealers long into the future. 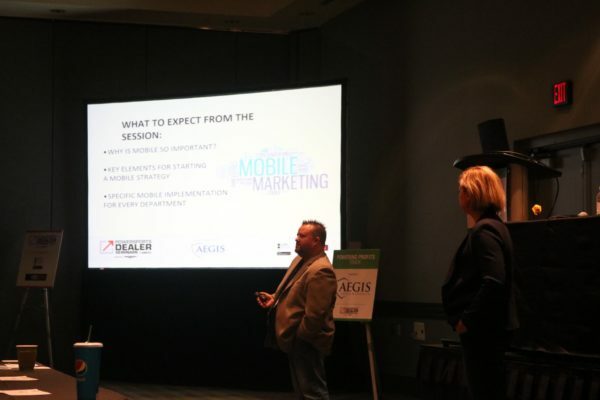 As someone that speaks to dealers every day and answers questions, makes suggestions, educates them and learns from them, it’s incredibly rewarding to see the industry evolving and, in many cases, leading all retailers in the technology space of mobile marketing. I can’t say it strongly enough but if you have any questions whatsoever about the mobile industry for your dealership please reach out. If I don’t have the exact answer to your question I will find the expert that will guide you to the best possible solution.